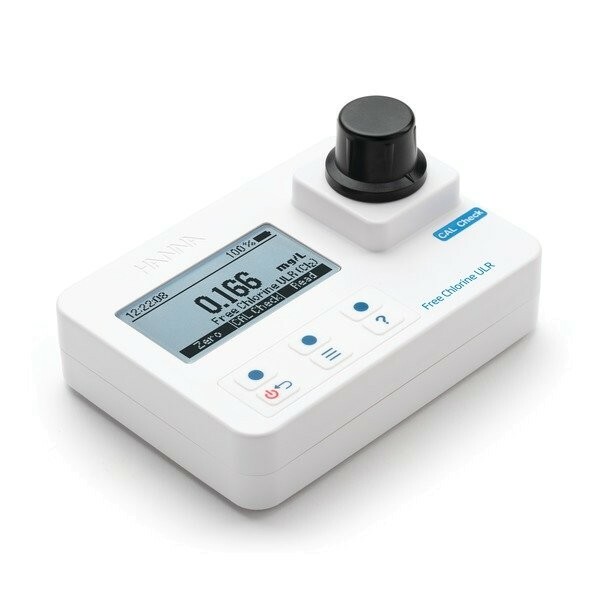 Product information "HI97762 Free Chlorine Ultra Low Range Photometer"
The HI97762 Free Chlorine Ultra Low Range Photometer combines accuracy and ease of use in a simple, portable design. The advanced optical system provides lab-quality accuracy while its user-friendly design is easy for any user making it the perfect photometer for your water quality testing needs. The HI97762 meter measures the free chlorine content in water samples in the 0.000 to 0.500 mg/L (ppm) range. No warm up time needed before taking a measurement. Tutorial mode for easy step-by-step instructions. CAL Check for performance verification and calibration. Let your photometer guide you through setup, calibration, and testing with on-screen tutorials and animations so you always know the next step. Simply access Tutorial Mode at any stage in the setup or measurement process with the dedicated help key. The auto-off feature prolongs battery life for peace-of-mind and energy savings if the meter is accidentally left on. When the battery level is below 10%, a warning symbol will blink to indicate low battery condition. When low battery power may affect your results, the meter will shut down to avoid erroneous readings caused by low battery level. Missed a measurement? No need to worry because your photometer will automatically log the last 50 measurements. The results can be viewed instantly using the Log Recall Menu. Hanna’s exclusive CAL Check feature provides a stress-free, straightforward way to ensure your photometer is working properly. Simply insert the certified CAL Check standards and let your meter guide you through validation. If your photometer is out of specification for any reason, simply calibrate to your standard. A Light Emitting Diode (LED) provides more light while using less power and a narrow band interference filter results in more accurate and repeatable readings. Designed to withstand the knocks, drops, and spills of real life, the new IP67 body ensures top performance in any environment. Internal optics are sealed from outside dust, dirt, and water. In addition, it floats, just in case you drop your meter in water. This photometer uses an exclusive positive?locking system to ensure that the cuvettes are placed into the holder in the same position for accurate readings every time. Made to fit comfortably in your hand for on-the-go testing or sit on a table for benchtop use, a backlit LCD display provides at-a-glance readings from any angle, day or night. The supplied AA batteries provide life for more than 800 measurements. We believe that buying a meter should be simple. Your HI97762 photometer has many of the necessary accessories needed for successful measurements. Upgrade to the Free Chlorine Ultra Low Range Photometer Kit (includes the CAL Check Standards) for the most economical option for testing. Related links to "HI97762 Free Chlorine Ultra Low Range Photometer"
Customer evaluation for "HI97762 Free Chlorine Ultra Low Range Photometer"